The push type F201 Cartridge replaces the Tornos F20-201 collet in your CNC spindle. 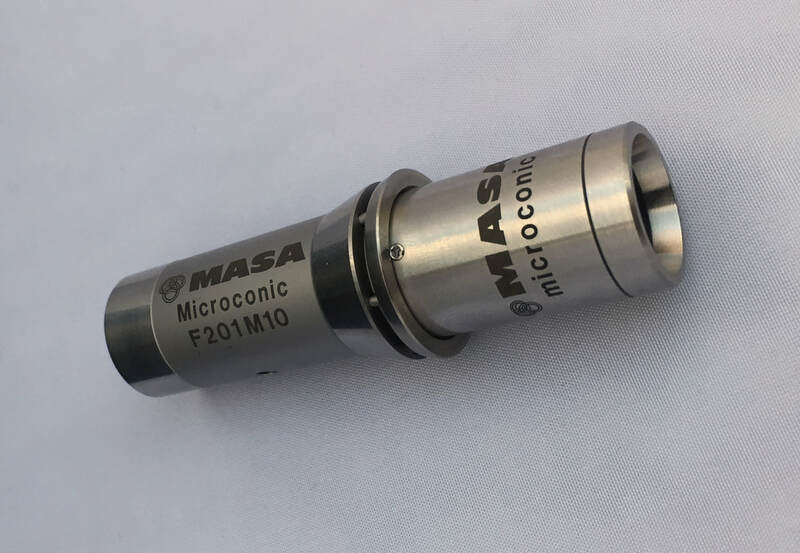 This enables you to use our Microconic collets to achieve concentricity guaranteed to be within 5µm (0.0002") in production use. ​Compatible with spindles that accept F20-201 collets including DIN 136E, Meister Swiss 136E, Schaublin F20 (76-201), Southwick & Meister F20-201, KEB (MasWerks) MC20-201, Hardinge F20-201 / 4709 collets. 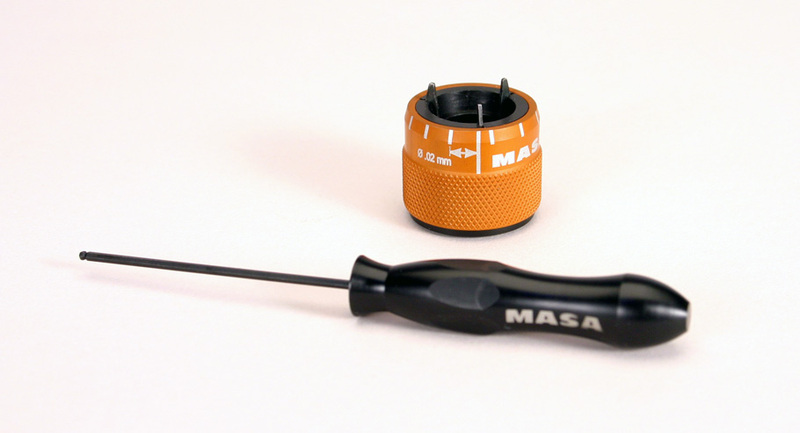 Masa’s Cartridge and Collet assembly is designed to vector the chucking force directly over the holding surface. This means that the chucking force can be reduced while at the same time the holding power is increased. This opens up the possibility of moving part operations to the sub-spindle and dramatically reducing cycle time. 20% ~ 40% cycle time reduction is commonly achieved. 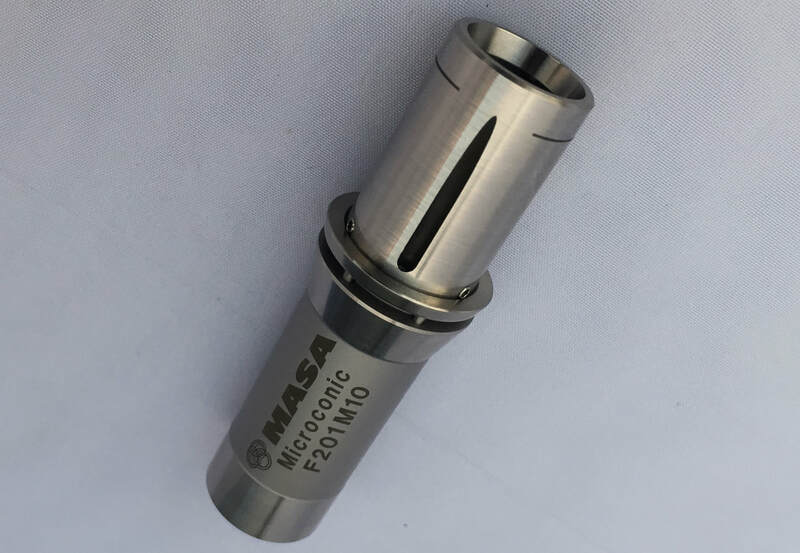 Micrometer dial control of collet clamping pressure regardless of the machines hydraulic or pneumatic collet closing force with the use of our Micrograd™ Wrench. See below for more details. Reduces the need for excessive force to hold the work piece. Significantly reduces chucking damage on the work piece. Thin wall chucking is now possible without crushing the part. Saves time due to overlapping machining in the main spindle. Part features that were not possible to machine before are now possible in the subspindle. Set ups are quicker and more repeatable with the Microconic™ system. Each cartridge includes a Micrograd Face Dial Wrench. You can document the micrometer-like adjust collet closure in your set up plan so it's done the same every time, regardless of operator skill and without relying on "feel". Our CW10 Micrograd™ Face Dial Wrench is included with the purchase the F201M10 Microconic Cartridges.